This combination of detached houses has been priced for a quick sale on a fast moving market segment with multiple buildings in one package, this property is a perfect opportunity for someone looking for a straight forward project without any structural work which can be completed while living in. The main house requires approximately 6.000 to 7.000€ to be finished depending on the spec. of materials & fittings, the areas of the main house which require finishing are: door frame surrounds, sinks and shower trays for en-suite bathrooms, minor tiling & taps, extractor hood, radiators, decorating and swap a few tiles from the north facing side of the roof. The property sits in a very private spot in a countryside hamlet with fantastic views. The area of activity on the south of the property is protected from the neighbours views by the presence of the houses on the back. The stone cottage itself could fetch between 35.000 to 40.000€ in current market prices, it will require approximately between 25.000 to 28.000€ to rebuild. There’s a 40sqm double floor garage and more external buildings which were used as animal quarters, perfect to rebuild as an outdoor kitchen. The main house consists: The front door is accessed via a balcony which in turn is connected the the cobbled street via a staircase, it has 4 bedrooms upstairs, the master is double aspect with access to the south facing balcony and en-suite with space for a shower tray. At the end of the upstairs hallway there’s a main bathroom with a bath tub and entrance from a second (en-suite) bedroom, the other 2 bedrooms one is single aspect south facing and the other is double aspect north facing. Downstairs under the south facing balcony there’s an area used as a utility and seating room, which is particular suitable as cosy winter sun room close to the outside patio which has a stone threshing circle. The very spacious downstairs open plan lounge, kitchen and dining room is approximately 60m2. On the lounge side there’s a large wood burner to one side with access cupboards for hot water tank, large patio doors on the other side, pre-installation for surround sound leading to the Plasma centre point and access via a door to an en-suite room with a double glazed door to the outside which is currently being used as an office. On the dining area there’s access upstairs via a concrete staircase with the area under it been converted as storage. The kitchen appliances included in this sale are: an electric oven, a gas hob and all the kitchen cabinets which include a breakfast island. The Stone cottage for renovation consists of: 2 or 3 bedroom over 2 floors, with enough space downstairs for a kitchen, bathroom and lounge with a large area facing south, the roof timber and tiles is all in sound condition. The garage is double floor with downstairs area being perfect to convert as a workshop. There’s a very suitable spot for a large swimming pool and quotations can be given on request. There are approximately 20 Olive trees and 12 Orange trees, plum trees, lemon trees, plenty water in 3 wells, unfortunately one of the reasons why the property is being offered at such reduced price is because the garden is vastly overgrown, we foresee the cost of clearing it being in the region of 1000€. The house is surrounded by numerous natural hiking tracks with great scenery spots provided by the mountains and forest land in Central Portugal, from the balcony of both properties the views are of the edge of the mountain of Alvaiázere. 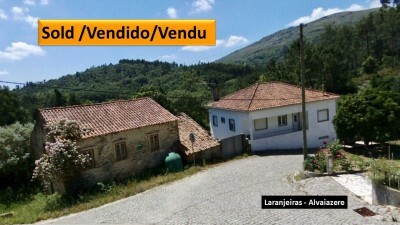 The property is located in the quiet hamlet of Laranjeiras which is just outside the Market town of Alvaiázere. This municipality town of Alvaiázere is 2.4km distance where you can find a registry office, notary services, banks, supermarkets, schools, public swimming pool parks, cafés en restaurants, etc. Around this area there are typical villages, mills, panoramic views, roman ruins, monuments, river beaches etc. The small castle city of Penela is about 30km distance. The historic town of Tomar, which is home to the UNESCO listed Convento do Cristo, founded by the Templars is only 30 to 35 minutes drive from the property. Figueira da Foz the beautiful coastal beach is easily accessed in approximately an hour by car via the IC8. All major European high street shopping is available in city of Coimbra the 3rd biggest city in Portugal which is only 45 minutes drive on the A13 motorway. Porto and Lisbon airports are at similar distance from the property, Porto is approximately 2 hours drive and Lisbon approximately 1.45h by car. Double glazed throughout with external rolling shutters. Pre-installation for solar hot water with electric back up and new tank. Pre-installation for surround sound in the lounge. Fully tanked downstairs with damp proof membrane, thermal insulation and plasterboard. The whole downstairs is tiled with large dark tiles, upstairs is varnished wood parket flooring throughout. Large open plan kitchen, dining room and lounge. Traditional 2/3 bedroom 98m2 stone cottage to renovate, good roof & structural.